Serkan Cura is spreding his wings in an intimate yet theatrical-literally and figuratively-show. Red velvet curtain were lifted up, unveiling the wonder of Serkan Cura's spring/summer collection. With his signature and mastery of feather bending, Serkan once again wowed us all, the audience, who were seated in the centuries-old Theatre Déjazet in Paris. 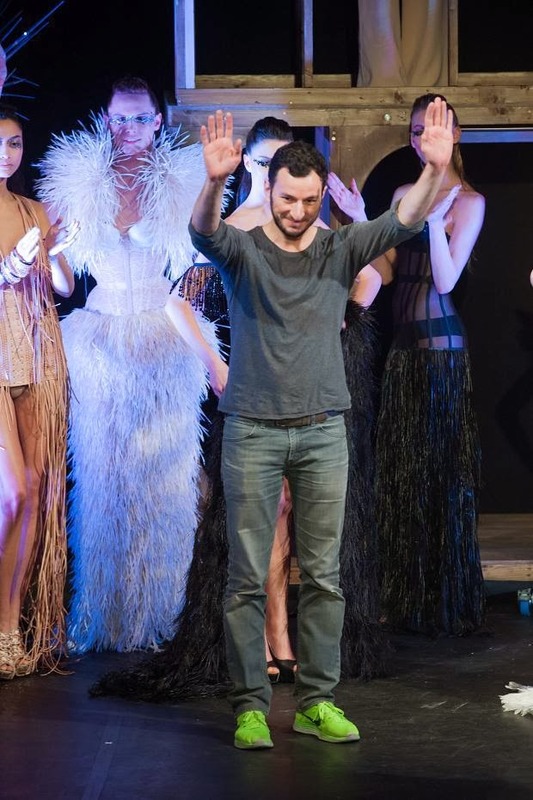 What unseemingly well-rehearsed blocking of the models didn't fail to show what he does best, turning thousands of feather pieces into an outré collection. Plumes were developed and processed in fashion to build artfully manufactured corsets, pantsuit, and resemble fur, to create look entirely made of light fur-like feathers. Perhaps the choice of the venue was not accidental; the looks were merely beautiful, some have the smell of burlesque. It has the grace of a ballerina, the shimmering beauty of the sea and its habitants, and yet offering the strength of a fantasy. What he explaine later after the show was even more shocking (read my interview a little later). His dedication and hard work to asemble a dramatic collection was started even longer in time nd further in distance than one could guess. Whow knows that the bird of paradise, or Pirates of The Carribean, was all where this colletion started? This man, is, after all, the master of feather. He could create whatever idea you pop out into a dainty couture out of feathers, which he has been collecting in years.